By Optimal Dentistry JJ Teeth Jun 14, 2018 2 Comments on Would you get a dental implant? Dental implants can be an incredible opportunity for individuals who do not have a full smile. Adults and seniors who are missing teeth, or need to have teeth extracted, can have them replaced with a fully functional, natural looking dental prosthetic. Through a carefully orchestrated procedure, dental implants are placed into the jaw bone, and a restoration is affixed to the top of the implant. This process is designed to give patients a full smile once again, ensuring proper dental health for a long time. The implants posts are screws made from titanium, a metal that is often used for joint replacements due to its ability to fuse with bone. When placed in the jaw and given time to heal, the jaw bone integrates the titanium screw into its structure. Research has found dental implants encourage bone growth in the jaw, which means jaw strength can be restored. 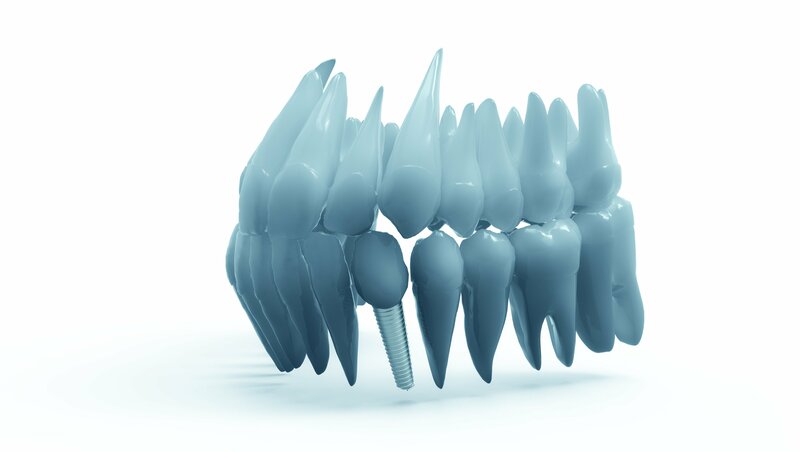 Dental implants are resilient to damage and retain strength, for they are inherently tooth root replacements. With a high success rate of long-term functionality, very few individuals face issues with their implants. Restorations are the visible part of the dental implant, fashioned from dental porcelain and made to match a patient’s exact tooth size and shape. The restorations can even be color-matched to ensure true uniformity. With adaptable restorations options, people missing a single tooth, multiple teeth, or whole arches of teeth can find a solution. Implant-supported restorations are nearly as strong as real teeth and mimic the way natural teeth look in the light, making them nearly indistinguishable from the rest of the smile. Dental implants offer many benefits, and one of them is the ability to have fixed dentures which do not cover the palate. Many individuals with dentures face using adhesives or suction to keep their dentures in place, but dental implants provide a solid and permanent foundation for them. Unless you or your dentist are cleaning the implant-supported dentures, they do not pop out. Additionally, patients may enjoy a full sense of taste and can smile knowing their restorations are strong and natural looking. Not all jaws are suited for dental implants, but Dr. J. J. Serfontein is highly skilled at formulating custom treatment options to suit your individual needs. If Dental Implants can’t work for you, there are a number of other option available to replace missing teeth. Would you mind contacting our office at info@jjteeth.co.za? We’d need to get some information before we can accurately quote.